Peter Parker’s (Tobey Maguire) alter ego, Spider-Man, is now no longer perceived as an unknown threat by New York, but is seen as its guardian angel. Parker’s life is going well too: he has the girl of his dreams, Mary Jane Watson (Kirsten Dunst), and is generally content. Predictably however, trouble is brewing when ex-convict Flint Marko escapes from prison and promptly has an accident on a government test side, turning him into the fearsome Sandman. On top of this, Parker also has to deal with hotshot new photographer Eddie Brock, a potential new love interest, and his former best friend Harry Osborn, who believes Parker killed his father, the Green Goblin. What this all means is that Spider-Man 3 is an overlong film with many diverse plot strands jostling for screen time. 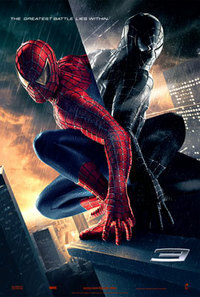 A sense of fun dominates Sam Raimi’s second sequel to his original Spider-Man (2002), and Raimi, who for the first time has also contributed to the screenplay here, seems to have let go of all restrictions, forgotten all pressures, and made an all-out, fun comic book adaptation. Unfortunately, this is also the main problem of this bloated, character- and effects-heavy film, since plot, focus and emotional depth are all forced to take a back seat to spectacle and a somewhat camp sense of humour. What the filmmakers have forgotten is the reason why Spider-Man works so well as a comic book movie hero: Peter Parker is an everyman, thrown into a strange new life full of huge decisions and responsibilities. Parker’s plight forms a virtual allegory for anyone who has felt alone, confused, betrayed and under-appreciated in their teenage years. Now, in part three, Parker, is an ordinary young man who has come to terms with his situation - so much so that he is so wrapped up in being Spider Man, he has forgotten his everyday responsibilities. Although the film is fun, fitfully exciting and, on a couple of occasions, touching, it never reaches the dramatic heights of the last two films. Above all they tapped into the trials of adolescence, whilst Spider-Man 3 tries to wrestle instead with an apparently bigger issue and fails. The tag-line is ‘the greatest battle lies within’, alluding to Parker’s/Spider-Man’s battle with his conscience, but this issue is never given enough time to truly develop. Indeed, you can’t help but feel that this is just filler before the main event: an inevitable duel between the four super heroes and villains. With too many characters and plot strands (James Cromwell as Captain Stacy barely registers) Spider-Man 3 has the great misfortune of feeling rushed and over-long, with battles taking precedence over emotion. A fun film perhaps, but one that - as with so many other recent sequels - is certainly a let down when compared to what has come before. This review was published on May 17, 2007.